Spend some quality time in our Quiksilver watch Sale and you’ll find just the right watches to suit your individual style. With the watch sale not only will you make great savings on our top of the range time pieces but you will discover a wide range of designs. Whether you're looking to go digital or analog, watches are still one of the most essential accessories you can get. In this season’s Quiksilver sale you will find High-quality Japanese components as well as the best technology and functions: Pre-programmed tide data for over 200 surf spots, including water level indicator, stop watch functions, built-in compasses and luminescent night dials so you know what time it is even during those late night beach BBQs. Our watches will stay with you for a long time - no matter what lifestyle you lead. Whether you are looking for an authentic surf look, a casual time piece, or a more contemporary look Quiksilver watches cover all the options - from chronos and tide watches to classic analogs. 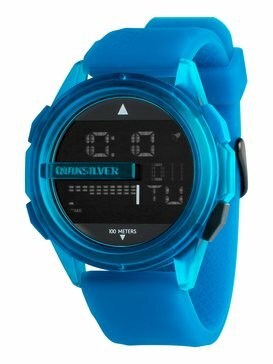 So whether you’re surfing, diving, checking your local spot or out with friends you'll be ahead of the times with the Quiksilver Men's Watch Sale. So browse our sale section now and find your favourite items for the late summer and a mild autumn at great prices.